Start your hydroponic garden with plants that you love and will use. If you are looking to recoup your investment, grow high-value plants that will save money for your family. Start small until you learn more about hydroponics and have some experience running a hydroponic garden. While most plants will grow under hydroponic conditions, these plants are popular among beginners because of their high success rate and economic value. Moisture-loving leafy crops such as lettuce, mustard greens, spinach, swiss chard, watercress, mint and kale do well in a raft hydroponic system, according to the University of Florida IFAS Extension. The vegetables sit in net cups inserted into a floating raft, dangling their roots into the hydroponic nutrient solution. The system is low-maintenance and produces a quick crop. Tomatoes are one of the most common hydroponic vegetables, according to the University of Massachusetts Extension Service. The flavor of vine-ripened hydroponic tomatoes is far superior to that of supermarket varieties. Tomatoes need a lot of moisture and thrive in the Nutrient Film Technique or the Ebb and Flow hydroponic system. Support is needed, and the plants can grow larger and faster than normal under hydroponics. .
After lettuce and tomatoes, peppers are one of the most suitable crops for hydroponic growth, according to the University of California Extension. 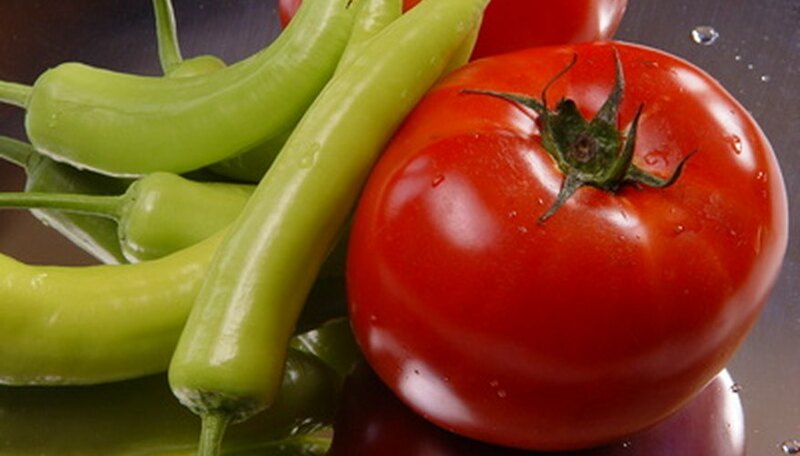 Like tomatoes, peppers love moisture and do well in an Ebb and Flow system. They take longer to grow but will continue producing as long as the fruit is promptly picked. There are many varieties of pepper seeds and plants available to the adventurous hydroponic grower. Herbs are well-suited for hydroponic growth and are favorites for beginner commercial systems. Basil and mint are currently being commercially grown in hydroponic systems. The plants are compact, needing little space. One concern when growing herbs is that the nutrient solution can flavor the herbs. Avoid this by flushing the system with water before harvesting herbs or using a dilute solution formulated for herbs. A small hydroponic garden can produce all the herbs needed for the average family. Strawberries are being grown successfully in small hydroponic gardens all over the world. Growing strawberries hydroponically allows berries to be grown in areas where they normally succumb to water and fungus diseases. The United States Department of Agriculture is recommending hydroponic strawberry growing on a commercial scale, because growing strawberries hydroponically eliminates the need for soil fumigation for these diseases. Diane Watkins has been writing since 1984, with experience in newspaper, newsletter and Web content. She writes two electronic newsletters and has a Bachelor of Science degree in chemistry from Clemson University. She has taken graduate courses in biochemistry and education. What Vegetables Can I Plant in the Topsy Turvy? What Tools Do You Need for a Hydroponic Garden?